Killtown Death Fest » Announcement #19: SCOLEX (us)! Tonight we turn our focus towards the States one more time for another band that has been around in various constellations but still never made it over to this side of the pond. After a small hiatus the band we are about to announce is back with a stronger line-up than ever and ready to conquer Europe with a one-off exclusive show at KTDF!!! We are very stoked to present to you the first and for now only Euro appearance of SCOLEX!!! Formed in Oakland, CA in 2010 by drummer/vocalist Justin Green and bassist/vocalist Erika Osterhout. Handling guitar duties themselves (with guest appearances from Danny Corralles of AUTOPSY, the duo recorded four tracks of doomy, punk-influenced death metal in late 2011, and released “Torn From Beyond” as a 12″ mini-LP on Osterhout’s own label Lunar Tomb Records. 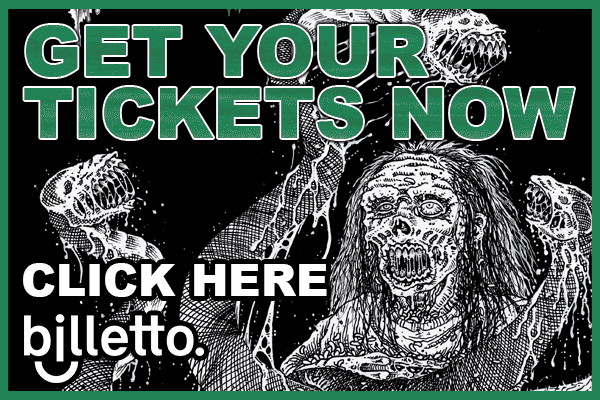 With a live lineup in place they did several mini-tours in 2012 and 2013 with bands like Necrot and Undergang. In July 2013 they opened for Autopsy’s first and only show ever in Seattle, WA, which lead to Eric Cutler replacing both guitarists in 2014 for a few shows including one with Undergang and Trepanation. Shortly afterwards the band went on hiatus but the members kept busy with other projects like Femacoffin, Extraction and Necrosic. 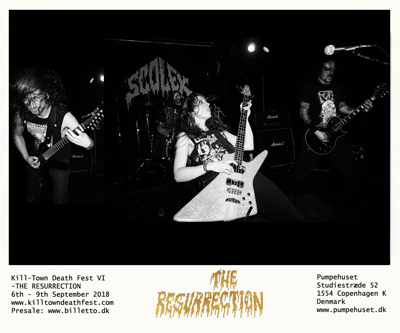 In 2018 Scolex returned with a new lineup of guitarists Sonny Reinhardt (Necrot, Saviours) and Paul Riedl (Spectral Voice, Blood Incantation) for another West Coast tour with Acephalix, Mortiferum and Fetid, sharing the stage with Mortuous, Hell, Skeletal Remains and more. With an exclusive European appearance at Kill-Town Death Fest this September and an impending split 7″ with Mortuous on Carbonized Records, Scolex is back and heavier than ever.